MOT® is an easy-to-use dictionary program developed by Kielikone Ltd. MOT brings you a wide selection of high-quality dictionaries through one user interface on several platforms (Windows, intranet, Internet, and mobile platforms). MOT’s dictionary selection includes large general language dictionaries, comprehensive dictionaries of technology and commerce, as well as specialist dictionaries for many domains. To guarantee high linguistic quality we cooperate with leading publishers and language professionals when building up MOT’s dictionary selection. For the best results, try grouping your most frequently used dictionaries into dictionary groups. You can even add your personal dictionaries to dictionary groups. When MOT is searching for a word in a dictionary group, it will look through all of the dictionaries in a dictionary group and display all of the translations for the word that you were looking for. Help us make MOT even better – we welcome feedback on MOT at feedback@kielikone.fi. For the latest news on MOT Dictionaries, please visit us at www.kielikone.fi. This Getting Started guide is designed to help you install and start using MOT as quickly and conveniently as possible. For the complete User’s Guide please refer to the Help menu of MOT. MOT 8 features a new, simplified and modernized user interface. MOT 8 introduces two new services: MOT Proofing and MOT Translation. These services bring proofing and machine translation to the same interface as your MOT Dictionaries. MOT 8 has improved compatibility with Windows 7 and all 64-bit editions of Windows. For up-to-date information on our dictionary selection, see our website at www.kielikone.com. MOT is available in several different versions for different platforms and different needs. The installation program uses your key code to determine which version you have purchased a license for and starts the installation automatically. The installation of MOT for workstations is described in chapter 2 below, and installation of MOT Intranet on Windows servers in chapter 4. Microsoft Windows XP® or later has to be installed on the workstation(s). Internet Explorer 6.0 or newer must also be installed. The Proofing and Translation services require that Internet Explorer can connect to the Internet. A hard disk with 60 MB of free disk space is needed. Furthermore, there should be space for dictionaries. The disk space requirement of Kielikone’s MOT dictionaries ranges between 400 kB and 100 MB. Together the dictionaries may require several hundred MB of disk space. The server should run Microsoft IIS. It should also have enough disk space for dictionaries. The disk space requirement of Kielikone’s MOT dictionaries ranges between 400 kB and 100 MB. Together the dictionaries may require several hundred MB of disk space. The installation program will automatically detect which type of license you have purchased based on the product key. Both versions are installed the same way, except that after installing the network version the program still has to be installed on all workstations. For the single user version, no workstation installation is needed. First, check the software and hardware requirements in chapter 1.4. In addition, read the license agreement in chapter 5 or in the installation program. Start installing MOT by clicking the link on the MOT download page. Begin the installation by inserting the MOT DVD into the DVD drive. If Setup does not start automatically, run Setup.exe from the DVD by typing D:\setup into the Windows Start menu search box (replace D: with the letter of your own DVD drive, if necessary). Press ENTER. By selecting the language (Finnish or English) of the installation program you will also select the default language of the user interface, that is, the language of MOT when first started. Enter the User name and the Product key in the exact form you got them from Kielikone. Remove the check marks of the dictionaries and other components that you do not want to install in the Select dictionaries dialog box. Destination folderis the directory where MOT is installed. In the network version, this should be a shared or shareable network folder. In the single user version the folder does not need to be shared. Finally, Setup informs that the installation is completed. For information on the next steps of network installation, please refer to chapter 2.3. For a brief guide on how to use MOT, see chapter 3. In the network version, you must finish the workstation installations after the server installation. The workstation installation creates the shortcuts needed to start MOT and copies the common dictionary configuration into each workstation as the local dictionary configuration. This is done by running workstat.exe from the server’s directory in which MOT was installed. If you want the MOT user interface to be in Finnish by default, use tyoasema.exe. Run workstat.exe with the user account under which you are going to use MOT to make sure that the correct HKEY_CURRENT_USER key is updated in the System Registry. In the MOT installation no active processes, operating system enhancements or system DLL files are installed. Therefore, the server does not need to be a Windows computer. It is sufficient that the users have read access to the MOT directory. You can choose not to run workstat.exe on all the workstations individually and instead create the shortcuts to motpro.exe using a network management program or a similar system. In this case, the user’s local dictionary configuration is empty by default. If you want to create it, run workstat.exe in one client machine and copy the System Registry key HKEY_CURRENT_USER\Software\Kielikone\MOTPRO into the Registries of the other machines. A default dictionary configuration is created during the installation. It is saved in the motconf.ini file in the MOT directory. You can change the Common dictionary configuration with MOT’s Settings/Edit Dictionary List command. You can prevent other users from changing the common dictionary configuration by removing their write permissions to the motconf.ini file which is located on the shared network drive in the MOT directory. Updating MOT usually means installing a new MOT version, installing a new dictionary, or modifying the common dictionary configuration. Before you update your MOT, make a back-up copy of your personal dictionaries. Make sure that no one is using it. Open the Windows Control Panel and select Uninstall a Program. Select the previous MOT version, for example “MOT 7.0 Professional“. Click the Uninstall/Change button or the popup menu item. After this, install the MOT update as instructed in chapter 2. Finally, start MOT and add the personal dictionaries into the dictionary configuration with Settings / Edit Dictionary List as described in chapter 3.3. Select Enter Product Key from the application menu. Enter the new User name and Product Key provided by Kielikone. Copy the new dictionary files from the mot8 directory of the MOT DVD into the MOT directory on your computer (usually C:\Program Files\MOT). Restart MOT and select the Settings / Edit Dictionary List command. You can now add the new dictionaries into your dictionary configuration. Remove the MOT icons from the workstations. It is unnecessary to remove the MOTPRO key from the system registry, as it does not affect the computer’s functioning. Below, you will find the basics on using MOT. For the complete User’s Guide, refer to the Help menu of MOT. Start MOT with the Start/All Programs/MOT/MOT commandof the Windows Start menu. Select a word in the active document of the word processor or browser. Press ALT+1 to activate MOT. The selected word is looked up in the active dictionary group. Select the translation you want and click the right mouse button. Select Transfer to copy the translation back to the document. Press ESC to minimize MOT to the Windows taskbar. You can exit MOT by selecting Exit from theapplication menu or by clicking the close button in the top right corner. On the Dictionaries tab you will find MOT’s dictionary services. 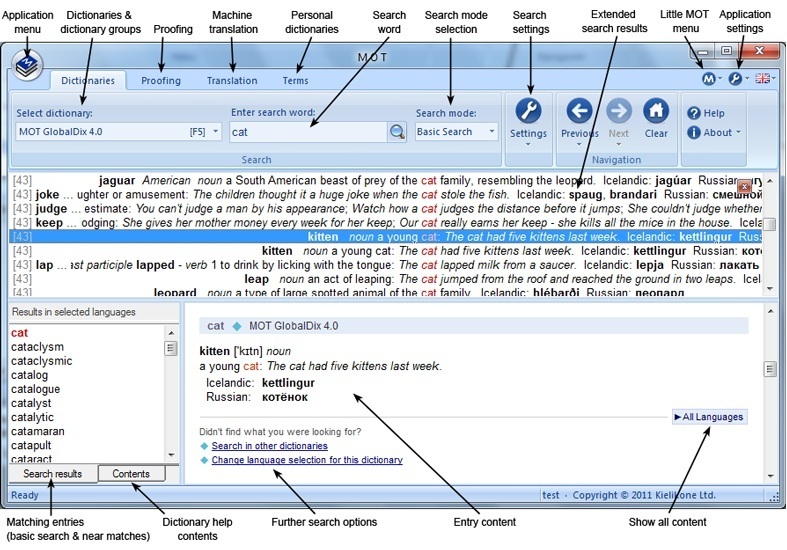 MOT shows the translations, grammatical information, usage examples and other notes on the search term in the Entry content frame. Other matches or near matches are shown in the Matching entries list. Clicking one of the words on this list shows the translations and the information for that term in the Entry content frame. By selecting the Contents tab at the bottom of the Matching entries list you can read the user guide for the selected dictionary. Among other things, the guide contains information on the abbreviations and special notations used in the dictionary. To look up the search term in your other MOT dictionaries, click the Search in other dictionaries link under the search results. For best results when using MOT, we recommend that you group dictionaries together based on usage scenarios. For example, you can combine all of the English dictionaries into one group or form a group of all the technical dictionaries. All of the dictionaries in the dictionary group will be used to look up the word you want so that you can search multiple dictionaries simultaneously. Use the Settings / Edit Dictionary List command to build dictionary groups. For more specific information, please refer to the User Guide in MOT’s Help menu. Use the right mouse button to quickly access most of MOT’s central commands. For a more in-depth guide to the MOT Dictionaries service, click the Help button. On the Proofing tab you can use the MOT Proofingservice which analyzes your English texts and helps improve their quality. MOT Proofing can be used when you are connected to the Internet. Start the proofing by clicking the Check text button. Clear all text and results by clicking the Clear Text button. For a more in-depth guide to the MOT Proofing service, click the Help button. On the Translation tab you can use the MOT Translation service which translates your texts from Finnish to English and English to Finnish. MOT Translation can be used when you are connected to the Internet. If you are translating plain text, type or paste your text to the window and click Translate Text. If you want to translate a file, click the Translate File button. Give the paths for your file and the result file and then click the Translate button. Supported file formats are txt, rtf, doc, docx, pptx, xlsx, pdf and html. The finished translation is saved under the filename you specified, and you can e.g. open the result file in a word processor. If you want to translate a website, click the Translate Web Page button. Give the address of the page and click Translate. The finished translation is opened in a new browser window. For a more in-depth guide to the MOT Translation service, click the Help button. On the Terms tab you can you use MOT’s Personal Dictionaries functionality. If you have created personal dictionaries with earlier MOT versions and want to use them with MOT 8 Workstation, follow the instructions delivered with the software. When you activate your personal dictionaries, the Terms tab becomes the My Dictionaries tab where you can edit your dictionaries. For a more in-depth guide to the MOT Terms service, click the Help button. If you do not have personal MOT dictionaries yet but would like to start using MOT Terms, contact our sales at sales@kielikone.fi. Before installing the program, check the software and hardware requirements in chapter 1.4. In addition, read the license agreement in chapter 5 or in the installation program. Install IIS on your server and enable CGI. Create a scripts directory for MOT’s executables. Install MOT from DVD or the MOT download page. Enable MOT executables in IIS. Below are details on each stage. Start by adding the Web server role to the server. Open Server Manager and select Add roles and features. Go through the Add Roles and Features Wizard and finally select Web Server (IIS) on the Server Roles page. Install the IIS Management Console tool when prompted. Then, on the Role Services page, enable CGI applications and, for Windows Server 2016, ISAPI Extensions under Application Development. Note: installing IIS may take a while and the server may be unresponsive while installing. First create a physical directory for the scripts, e.g. C:\Inetpub\scripts. Go to Server Manager ⇒ Tools ⇒ Internet Information Services (IIS) Manager. Open the Default web site in the Computername / Sites / Default web site. Right click the Default web site icon. From the pop-up menu, select Add Application. In the Add Application window, enter scripts in the Alias field, and the name of the directory created for scripts in the Physical path field (C:\inetpub\scripts, for example). Also, enable the CGI-exe handler for the *.exe-files: click the newly created scripts application in the Computername / Sites / Default web site. In the Features view, doubleclick Handler mappings. Select Edit Feature Permissions… from Actions menu on the right column. In the Edit Feature Permissions window, enable Execute permissions. Make sure that the scripts or cgi-bindirectory asked during the setup is correct. That is where the executables (netmot.exe, netmotext.exe and netmotoff.exe) will be copied. Remove the check marks of the dictionaries and other components that you do not want to install in the Select components dialog box. Destination folder is the directory where MOT is installed. Finally, Setup informs that the installation is completed. After the server installation, you should create a MOT link onto your company intranet pages for users to find MOT. The User Guide for end-users is integrated in the user interface. After the installation, the URL of MOT has the following structure: http://server/scripts/netmot.exe or http://server/cgi-bin/netmot.exe. You can usually test MOT locally on the server at http://localhost/scripts/netmot.exe or http://127.0.0.1/scripts/netmot.exe. Go to Server Manager ⇒ Tools ⇒ Internet Information Services (IIS) Manager. Select Computername in the Connections pane. Open the ISAPI and CGI restrictions view. In the Actions pane, click Add to open Add ISAPI or CGI Restriction window. In the Add ISAPI or CGI Restriction windows, enter the path C:\Inetpub\scripts\netmot.exe in the ISAPI or CGI path field and click Allow extension path to execute. Click OK. Add C:\Inetpub\scripts\netmotext.exe and C:\Inetpub\scripts\netmotoff.exe the same way, too. Start by adding Web server role to the server. Go to Start ⇒ All Programs ⇒ Administrative Tools ⇒ Server Manager. In the Server Manager, go to Roles Summary, and then click on Add Roles. Go though the Add Roles Wizard and finally select Web Server (IIS) on the Select Server Roles page. An introductory page will open with links for further information. In the Select Role Services window, enable CGI applications under Application Development. Note: installing IIS may take a while and the server may be unresponsive while installing. Create physical directory for the scripts directory: C:\Inetpub\scripts, for example. Go to Start ⇒ Administrative Tools / Internet Information Services (IIS) Manager. Open the Default web site in the Computername / Sites / Default web site. Right click the Default web site icon. From the pop-up menu, select Add Application. Make sure that the scripts or cgi-bin directory asked during the setup is correct. That is where the executables (netmot.exe, netmotext.exe and netmotoff.exe) will be copied. After the server installation, you should create a MOT link onto your company intranet pages for users to find MOT. The User Guide for end-users is integrated in the user interface. After the installation, the URL of MOT has the following structure: http://server/scripts/netmot.exe or http://server/cgi-bin/netmot.exe. You can usually test MOT locally on the server at http://localhost/scripts/netmot.exe orhttp://127.0.0.1/scripts/netmot.exe. Go to Start ⇒ Administrative Tools ⇒ Internet Information Services (IIS) Manager. Select the Computer name in the Connections pane. Open the ISAPI and CGI restrictions view. In the Actions pane, click Add to open Add ISAPI or CGI Restriction window. In the Add ISAPI or CGI Restriction windows, enter the path C:\Inetpub\scripts\netmot.exe in the ISAPI or CGI path field and click Allow extension path to execute. Click OK. Add C:\Inetpub\scripts\netmotext.exe and C:\Inetpub\scripts\netmotoff.exe the same way, too. Some Vista and Windows 7 versions include Internet Information Server. IIS is not installed by default, though. Install IIS on your computer and enable CGI. Go to Control Panel ⇒ Programs and Features. In the left pane, click Turn Windows features on or off. In the Windows Features window, open the branch Internet Information Services. Click the checkbox and also open the World Wide Web Services branch. Open the Application Development Features branch and click the CGI checkbox. Also install the IIS Management tool: in the Windows Features window, open Internet Information Services branch. Click the Web Management Tools checkbox. Go to Control panel / Administrative Tools / Internet Information Services (IIS) Manager. Open the Default web site in the Computername / Sites / Default web site. Right click the Default web site icon. From the pop-up menu, select Add Application. Also, enable the CGI-exe handler for the *.exe-files: click the newly created scripts application in the Computername / Sites / Default web site. In the Features view, doubleclick Handler mappings. Rightclick the background of the Features view and select Edit Feature Permissions from the popup menu. In the Edit Feature Permissions window, enable Execute permissions. Go to Control panel ⇒ Administrative Tools ⇒ Internet Information Services (IIS) Manager. Select Computername in the Connections pane. Open the ISAPI and CGI restrictions view. In the Actions pane, click Add to open Add ISAPI or CGI Restriction window. In the Add ISAPI or CGI Restriction windows, enter the path C:\Inetpub\scripts\netmot.exe in the ISAPI or CGI path field and click Allow extension path to execute. Click OK. Add C:\Inetpub\scripts\netmotext.exe and C:\Inetpub\scripts\netmotoff.exe the same way, too. The intranet version of MOT can be used with the Research pane of Microsoft Office 2003 or higher. For more information, go to the Dictionaries tab in MOT, open the user guide by clicking Help, and navigate tothe section “How to use MOT with Microsoft Office Research Pane”. To update MOT Intranet, uninstall the installed version, then install the new version as instructed above. If you have customized the installation (e.g. netmot.cfg), save the customized files before uninstalling. After installing the new version, reapply the customizations. Select MOT Online Intranet, Windows. The User agrees to be bound by the terms of this Agreement by installing or copying the Product, by taking the Product into use, or by otherwise making use of the Product. If the User does not agree to the terms of this Agreement, Kielikone Ltd. will not grant the User the right to use the Product. In such a case the Product must not be installed, made copies of or used, and the User must promptly contact Kielikone Ltd. and return the Product together with all accompanying material. Kielikone Ltd. has the right to make amendments of specifying and/or technical nature to this Agreement. The amendments will come into effect when Kielikone Ltd. posts the amended Agreement on its website or otherwise informs the User of the amendments. Should this Agreement, its interpretation or any other related issue require further clarification, the User should contact Kielikone Ltd. Provided that the User has agreed to the terms of this Agreement, Kielikone Ltd. grants, against the payment of a license fee, the User the right to use the Product for its customary purpose for a limited time period and according to the terms of this Agreement. With this Agreement, Kielikone Ltd. grants the User one user license. The user license is personal or the user license grants the User the right to use the Product on one single device at a time for the time period covered by the paid license fee. Sharing the user license with other users or using the Product in multiple devices is prohibited. The Product may be distributed to other users via an internal computer network only if each user has his/her own user license. Kielikone Ltd. grants the User only the rights specifically listed in this Agreement. All rights not granted to the User herein, including copyrights and other intellectual property rights, are vested in Kielikone Ltd. The copying of the Product or other material accompanying the Product is allowed only if it is necessary when using the Product according to the terms of this Agreement. Unlawful copying, including that for personal use, is prohibited. It is permitted to make one copy of the Product for backup purposes. It is prohibited to make any changes into the Product and the User must not modify, reverse engineer, decompile or disassemble the Product or its parts, or let any third party do so, other than to the extent expressly permitted by the law. The Product shall not be used as a part of other products, services or programs without the prior written permission of Kielikone Ltd. The material accompanying the Product may be used without the prior written permission of Kielikone Ltd. only when using the Product in accordance with the terms of this Agreement. The User must store any user identification and license keys, or other similar identification information related to the Product, in a secure manner and make sure that they cannot be accessed by any third parties. In case any of the user identification information has been accessed by a third party, or there is reason to suspect this might have occurred, Kielikone Ltd. must be immediately notified thereof. The user license of the Product must not be transferred without the prior written permission of Kielikone Ltd. except within a user community (the household or company or community which has purchased the user license). If the user license is to be transferred from one device to another within the user community, the Product and its accompanying material must be deleted from the original device. This agreement, including the user license, shall be valid for the time period covered by the payment of the corresponding license fee after which the Agreement and the license will be terminated automatically. Kielikone Ltd. has the right to terminate this Agreement immediately without notice if the User fails to comply with any provision of this Agreement. When the Agreement is terminated, for any reason, the User’s license to use the Product is terminated, and the User must immediately stop using the Product, and the Product, all copies of it, and all accompanying material must be destroyed immediately. The User may update the Product according to the current updating terms and instructions. Kielikone Ltd. reserves the right to modify the Product by adding features to the Product or removing features from the Product in an update provided that the basic use of the Product is still possible after the update. Kielikone Ltd. warrants the material on which the Product is recorded against defects in materials and workmanship under normal use for a period of six (6) months from the date of delivery. This warranty does not apply to damages caused by accident, negligence or misuse. The above mentioned warranty is the only warranty given. The Product and accompanying material are delivered “as is” without warranty or commitment of any kind regarding their features. Kielikone Ltd. does not warrant, guarantee or make any representations regarding the use, or the results of use, of the Product or accompanying material in terms of correctness or accuracy. All risks with respect to the use of the Product are transferred to the User. Kielikone Ltd. is to no extent liable for service or correcting or removing defects. However, Kielikone Ltd. shall be liable to consumer customers for defects of the Product in accordance with the Finnish consumer protection legislation. In case of defect covered by the warranty in the Product during the warranty period, Kielikone Ltd. reserves the right to replace the faulty Product with a new one. No oral agreements, instructions or promises shall be binding on Kielikone Ltd. In no event shall Kielikone Ltd. be liable for any indirect, consequential or incidental damages. In all cases the liability of Kielikone Ltd. for any damages shall be limited to the price paid to Kielikone Ltd. for the Product. Any disputes arising of or in connection with this Agreement shall be finally settled by arbitration. The arbitrator or arbitrators shall be appointed by the arbitration board of the Finnish Central Chamber of Commerce, and the arbitration shall follow the regulations of this board. Kielikone Ltd. has the right to collect its outstanding claims by judicial court proceedings instead of by arbitration through the general lower court of the forum domicilii of Kielikone Ltd. However, if the User is a consumer customer, the User may take legal action in a general court of law. This Agreement as well as the settlement of any disputes over this Agreement are governed by the laws of Finland, excluding the rules of the choice of law.